Applications are now open for Student President of Cambridge University Musical Society. CUMS this year celebrates its one hundred and seventy-sixth year, and boasts a rich history of fostering the best musical performance in the University. Today the ensembles include the Cambridge University Orchestra and Sinfonia, the Cambridge University Wind Orchestra, the Cambridge University Symphony Chorus, the Cambridge University Chamber Choir and Cambridge University Percussion Ensemble, as well as associate ensembles such as Cambridge University Jazz Orchestra and Cambridge University New Music Group. 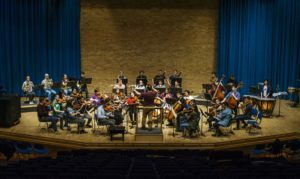 The vision of the society is to promote the highest level of music making to the greatest number of Cambridge students. The role of Student President is an invaluable insight into the world of arts management. The President is intimately involved with all areas of the vision and running of CUMS, whether co-ordinating programming, chairing meetings of the Management Committee, being the student representative at the Board of Trustees, representing the interests of students, welcoming guest conductors and soloists, and, ultimately, being able to enjoy not only the planning and preparation of fine concerts across all ensembles, but their performance too. The role of Student President never demands more than a few hours per week. It requires somebody who is organised, efficient, confidant working with students, trustees and guest musician alike, and is passionate about music making and arts management. It is open to all students, undergraduates and postgraduates, at the University of Cambridge. If you’d like to know more about the role, please speak to Ed Liebrecht (ejl52) or Chloe Davidson (cnd26). To apply, please send Katharine Ambrose (kla39) a CV and covering letter detailing your interest in the role, both what you’d be looking for in the role and what you would be able to give to CUMS through it. The deadline is 5pm on 26th April.